On Thursday 28th July 2011 the High Court in London gave judgment in favour of Adelphi Masterfil, in an action brought against Filling and Capping Machines Ltd and Brian Potiphar. The Judge found that Filling and Capping Machines Ltd. (FCM) had used a number of Masterfil’s design drawings in order to produce their own design drawings. He rejected FCM’s defence of independent design and held that both FCM and Mr Potiphar were liable fo r FCM’s wrongful use of Masterfil’s drawings. Separately, he also found that both FCM and Mr Potiphar had infringed Masterfil’s copyright in a manual for a Masterfil machine. The Judge also found that on his day of departure from Masterfil, Mr Potiphar had emailed to his home email address Masterfil’s confidential databases containing customer lists, sales information and stock details. The Judge went on to grant injunctions against FCM and Mr Potiphar and ordered them to pay 80% of Masterfil’s legal costs. Masterfil’s legal costs will be paid by FCM and Mr Potiphar in stages, of which the first stage amounts to £76,500. 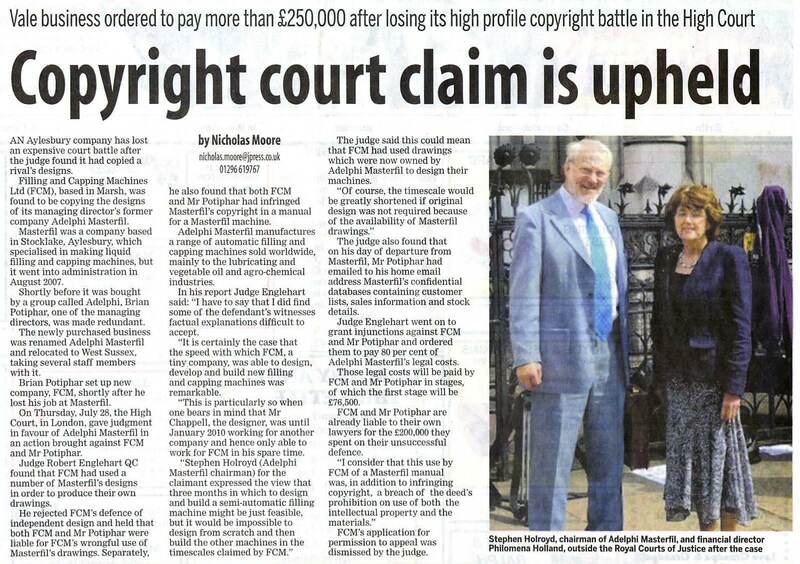 FCM and Mr Potiphar are already liable to their own lawyers for the £200,000 they spent on their unsuccessful defence to the action. FCM’s application for permission to appeal was dismissed by the Judge.